Οι Dream Child είναι ένα συγκρότημα που αποτελείται από έμπειρους μουσικούς κι απευθύνεται κατά βάση στους φίλους της μουσικής του Dio. Τα τρία από τα πέντε μέλη της μπάντας (Craig Goldy, Rudy Sarzo, Simon Wright) έχουν συνεργασθεί στο παρελθόν με τον R.J.D. Στα μέσα του πρώτου φθινοπωρινού μήνα θα κυκλοφορήσει ο δίσκος "Until Death Do We Meet Again" και το πρώτο δείγμα γραφής είναι πιο Dio κι από τον... Dio! Craig Goldy: «The band Dream Child was conceived during a brainstorming session with Serafino (President of Frontiers) one day while discussing other matters over the phone. I mentioned that I had been listening to my favorite bands a lot recently, Deep Purple and Rainbow's “Rising" album, among others in that style and had noticed that many people who also love those bands often have the very same comments as one another: "They don't make music like that anymore!" Even though I said that in passing, Serafino asked me a question that would forever shape my future. He simply asked, "Well, can you?" and I said.....”YES!!!" We are so very fortunate to have bassist Rudy Sarzo as a featured guest, Simon Wright on drums, Wayne Findlay on guitars and keyboards, and a surprise vocal discovery from Argentina, Diego Valdez, whose voice will send shivers up your spine! This album will bring back memories of the days most people have thought were long gone and never to return, yet it is also new and fresh enough to be unique with some unexpected twists and turns!! No more "same old, same old" here, no fillers. Every song is an oasis in the desert and a rare gem in the coal mines of life in this new world that thinks the past greatness of rock would remain in the past. We've brought it back to life once again! 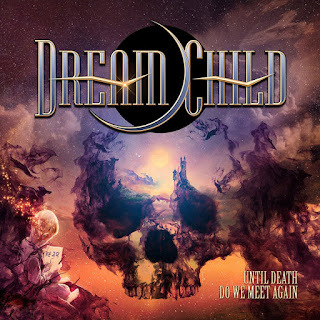 Audio: "You Can't Take Me Down"
Album: "Until Death Do We Meet Again"
METAL BLOGGER 7 Ιουνίου 2018 - 10:47 μ.μ. Δίκιο έχεις. Πιο Dio και από τον Dio. Δε ξέρω αν με χαλάει αυτό.